Corsair announces Hydro Series HG10 GPU N980 and HG10 N970 cooling brackets for NVIDIA's GeForce GTX 980 Ti, Titan X, GTX 980 and GTX 970 graphics cards. These brackets enable you to use any Corsair Hydro Series CPU cooler with supported video cards. The brackets are sold via Corsair's website for $59.99, you can check compatibility for the N980 here and the N970 at this page. 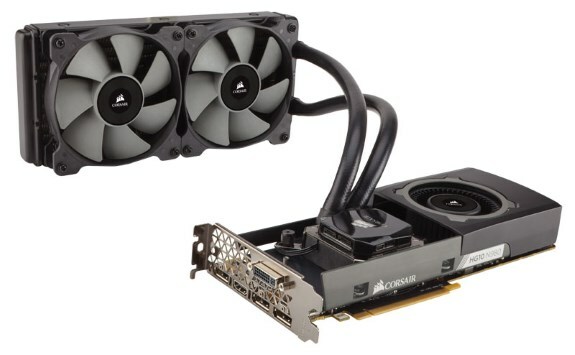 Corsair®, a world leader in high-performance PC hardware, today announced the immediate availability of its new Hydro Series HG10 GPU N980 and HG10 N970 cooling brackets for NVIDIA® GeForce® GTX GTX 980 Ti, Titan X, GTX 980 and GTX 970 graphics cards. Easy to install and compatible with any Corsair Hydro Series liquid CPU cooler (sold separately), the HG10 N970 and N980 help to substantially reduce your GPU’s temperature, allowing for greatly increased overclocking headroom and providing as much as a 25% clock speed increase. Designed to work with any stock PCB layout NVIDIA GeForce GTX 980 Ti, Titan X, GTX 980 or GTX 9701, the HG10 N970 and HG10 N980 replace the existing air cooling of the graphics card with a precision engineered aluminium bracket, allowing users to them fit a Corsair Hydro Series liquid CPU cooler directly to the GPU. With modern graphics cards outputting over 250W of heat, a liquid cooling system is a more efficient and powerful way to keep your graphics card cool. Lower temperatures mean users can overclock their GPU with fewer thermal limitations, allowing for improved performance and higher frame rates, all while running quieter than a standard air-cooler. The HG10 N980 and N970’s aluminium bracket and integrated 70mm low-noise blower fan also work to actively cool your GPU’s other heat producing components. The HG10 N980 actively cools both the card’s memory and VRMs, while the HG10 N970 actively cools the VRMs. Whichever one you use, The HG10 ensures quiet and efficient two-stage cooling for the whole graphics card, not just the GPU. The HG10 N980 is compatible with any stock PCB layout NVIDIA GeForce GTX 980 Ti, GTX Titan X or GTX 980, while the HG10 N970 is compatible only with stock NVIDIA GeForce GTX 970 GPUs. Both are fully compatible with Corsair’s complete range of Hydro Series Liquid coolers and are available immediately from Corsair’s world-wide network of authorized distributors and resellers. Both are backed with a limited 2-year warranty and Corsair’s excellent customer service and technical support.